My boyfriend and I spent the afternoon hours of Memorial Day wandering around Manhattan, surprisingly energetic after running a blazing hot 5k on Roosevelt Island. During our travels, we stumbled upon Mad. Sq. Eats, a collection of food vendors alongside Madison Square park. Because it ends this Friday, May 30, and doesn’t resume until September, we decided to sample some of the offerings before it was too late. Our first stop led to the discovery of my new favorite lunch food: a corn, coconut, and curry sauce summer roll from Two Tablespoons. 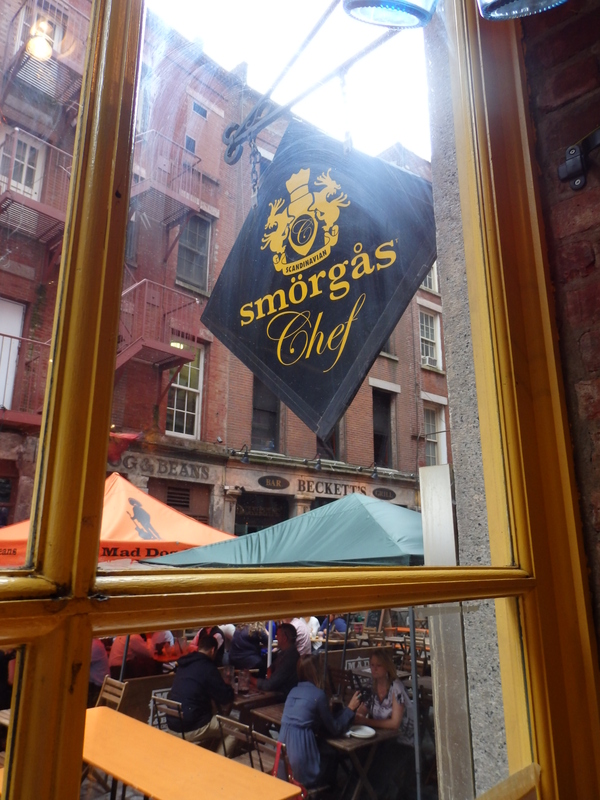 Today I took my friend Megan (who is also my brother’s girlfriend) to one of my favorite restaurants in Manhattan’s Financial District: Smorgas Chef. Located on Stone Street, a lively cobblestone road lined with bars and hot spots, this Scandinavian eatery boasts a menu full of “new Nordic cuisine,” which is “deeply committed to using local, sustainable, and all-natural ingredients,” largely from its 160-acre farm in the Catskills.